01/29/2016 – Update v6.5 Battle For Souls DLC, New Deck Searching & lots of fixes! We’ve got another update for you this week as we wanted to get our new Deck Searching feature out and tested. You can still search the old way with the wheel – this is now called Public Searching as everyone can see you search through it and manipulate it. The new deck searching is called Private Searching and it shows up in a grid window and only you can see it. Play with it, try all different things and let us know on our forums if you encounter any bugs. Our next DLC is Battle For Souls by Robert Burke Games and published by Greenflame Games. 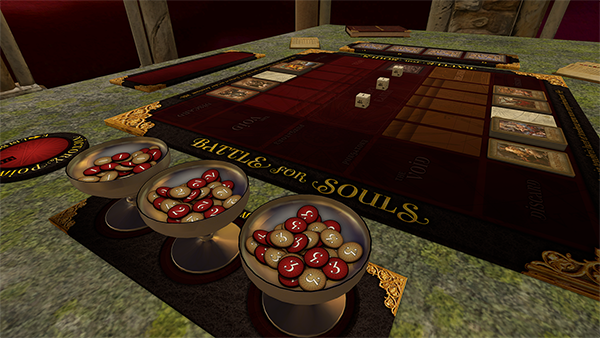 Battle For Souls is an epic medieval card and dice game for 1-4 players pitting the forces of Hell against the forces of Heaven in a fight for the eternal souls of humankind. If any issues pop up, please post on our forums. Enjoy! 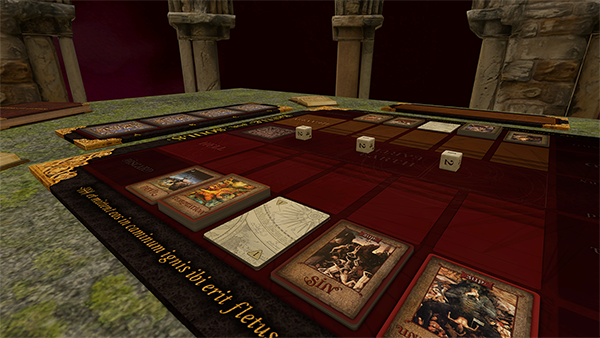 We have partnered with Greenflame Games to bring Battle For Souls by Robert Burke Games into Tabletop Simulator! Now available for $4.99 with a 10% launch discount! 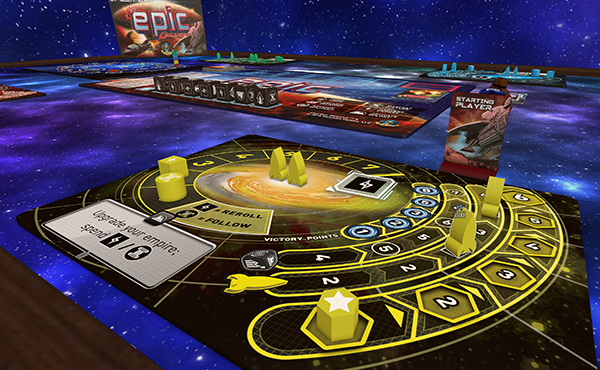 The game can be played solo or up to 4 players. The game lasts approximately 60 minutes. The rule book uses the new States feature, giving the illusion of a closed book and open book. If you’d prefer to read the PDF, the tablet is hidden in the game box with a link to it. Dials are easy to use. Hold your LMB on the outside circle and press E or Q for the right number and the inner circle + E or Q for the left number. Fixed issue with cards falling through mat. Fixed rockets to start upright. You can use the new States feature to quickly switch between their positions. Reduced size of the satellite tokens. We have completely revamped Deck Searching. The old wheel public searching is still available for those who prefer it. The new deck search is for private use. You can drag and drop cards, move cards around in the grid and search within the deck. Right click to open the contextual menu. If you click on the word Search, it will open the private search. Otherwise, you can choose between the two searches. 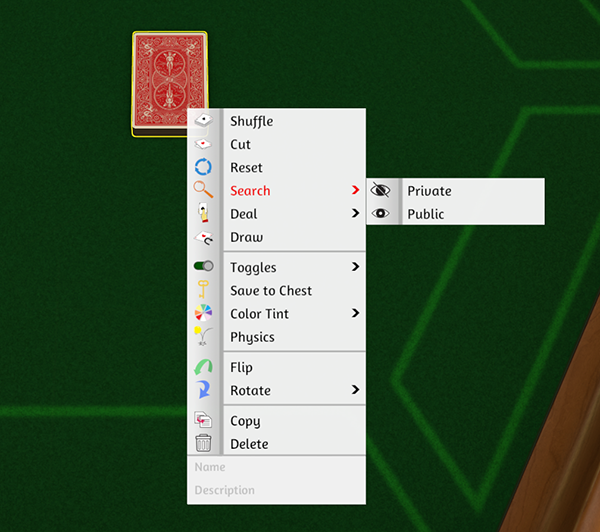 When you search, a magnifying glass icon in your player color appears over the deck, so everyone else knows that you are searching it. You can drag other decks or cards into the search to add to it if needed. If multiple are searching the deck, only the first person can modify it, but everyone else can see if they are also searching the deck. If you named your cards, you can search at the top for a specific card you’re looking for. Otherwise, they are numbered in order from 1st to last. While the deck can be picked up and moved around, you cannot remove anything from it or manipulate it in any way. Upgraded Proxy and Master Servers. Added a disconnect message so you know when you disconnect from IRC. Added an automatic reconnect to IRC if you type in the global chat when disconnected. Added other files for Linux Tablet to work. Facedown decks will now show tooltips properly. Objects in infinite bags are slightly higher up so they are easier to see. Improved the accuracy of the sticky option pickup. Contextual menu now hides the item name when object is hidden. Delay description tooltip for UI pointers added for tools menu. Cards now inherit toggles settings from their deck (IE. Grid, snapping, etc). Fixed ALT Zoom for certain cards in Mistfall DLC. Fixed collider size issues with Custom Tokens. Fixed IRC so disconnect issues are less problematic. Fixed the saved chest menu not closing with the ESC key. Fixed copy pasted tokens falling through world. Fixed Mp3 Player rectangle outlines on buttons. Fixed issue with objects with origin points below the sticky object not being grabbed. Fixed issue with rewinding messing up the word wrap of the text tool. Fixed issue with cards being held below hand layer on rectangle table. Fixed issue with custom token breaking if deleted too fast. 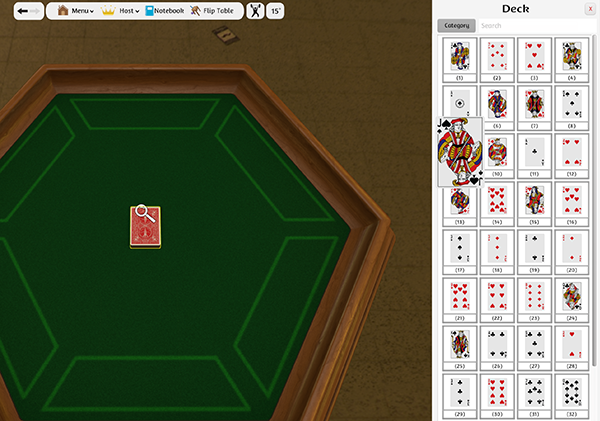 Fixed issue with not being able to interact with the table when the camera is fully zoomed out. Fixed issue with spectators not being able to see 3D object tooltips. Fixed issue with description not appearing if multiple objects are hovered over. Fixed issue with certain JPEG types crashing the game. Fixed issue with spectator 2D pointer not hiding when ALT Zooming. Fixed issue with objects falling through the table if you try to do an action when loading. Fixed issue with objects ending up locked when they weren’t supposed to be. Fixed issue with certain custom objects losing custom physics material settings. Fixed issue with objects clipping into stuff when flipping and rotating objects when not holding them. Fixed issue with objects scaling instantly using Shift + ALT Q or E.
You can now see other people’s pointers when they are interacting with tablets.